I don’t normally allow guest blog posts because… well, mostly because I’m a jerk and I like to keep my blog all to myself. But then I read this post on Chris Mooney’s upcoming “The Republican Brain”. It’s part of an on-going liberal “Science says that Republicans (or conservatives or religious people) are dumb (or driven by fear or some other negative neuro-psychological phenomena)” talking point. So I asked my brother (a neuroscientist entering med school this fall) to take a look at the piece and comment on it. What you’ll find below is his response. If you look at nothing else, check out the chart where he suggests other liberal/conservative conclusions based on the same “evidence” Mooney uses to bolster his “science-y” nonsense. Whenever I see a study claiming “science proves XYZ about conservatives (or liberals)”, I roll my eyes and sigh. There is currently a problem of misuse and mis-referencing academic and peer-reviewed articles for the purpose of substantiating an argument or point-of-view that is already held by those offering up these studies. For those who use scientific results to convince their audience as part of a job, this amounts to nothing short of inherent bias, a position that is staunchly avoided and rejected by reputable scientists. Pervasive ignorance is nothing new, but with the advent of the internet the ignorant have easy access to science that is outside their area of expertise (or amateurism for that matter) and the misuse of science as a tool for manipulation has made the function and even purpose of the original studies grossly misunderstood. The article continues in the now common, though still unpredictable, ramblings of the politically entrenched ideologues who are convinced all science (reason, common sense, credible faith, or any other citation used as a source of truth) supports their position. Often such overzealous ideologues attempt to discredit any source that contradicts their position, making manipulation of information their primary weapon for influence. This is not to say that idealists are categorically given to this tendency, nor is this any attack on ideals themselves. This critique is directed entirely at ideologues, i.e. those *blindly* committed to their belief systems who leave no room for discussion or counter-positions—these are the most common culprits. While Holland and Mooney can be given credit for citing not just one, but two (TWO!) whole studies from reputable sources, their understanding of neuropsychology and scientific studies is patently flawed, evident from his misinterpretation of the findings. While I am by no means an expert in the field, I have an advantage over Holland: this actually *is* my field. I have five years of graduate/postgraduate experience in neuroscience research, with multiple publications in peer-reviewed journals. Holland’s handling of this study is such a far-cry from the kind of discussion these results would inspire in academic circles that addressing his article does not require an expert, just experience. While this is not meant to be an exhaustive analysis, I’ll identify some major, obvious problems with his interpretations. There is no brain structure that can be summarized completely in just a couple of sentences. Neither does there exist a higher-order brain structure to which we could attribute a complete understanding of its functions. It is true that the amygdala is activated in states of fear and anxiety. I’m not sure why Holland cites Chris Mooney, a journalist, for further explanation of the function of the amygdala. While Mooney works with scientists, it is in the art of communication; Mooney himself has no substantive background in science. I suspect I know why he didn’t cite these scientists: neither Holland nor Mooney are out to educate the public with this article, to fill the world with knowledge. This article is about winning, about attacking the enemy until it appears as defeated, inferior and cowering in its own nightmarish landscape. Citing an ideologue who agrees with him is easier than citing a scientist who will readily tell you that things are more complex than that. If we interpret this in the same way that Holland did, by oversimplifying the brain into one concise function, then we can say that extroverts and those with bipolar-disorder are extra fearful and more likely to be conservatives. Similarly, those with narcolepsy, schizophrenia, obsessive-compulsive disorder, high-risk for alcohol dependence, Alzheimer’s, post-traumatic stress disorder, major depression, and pedophilic tendencies have significantly reduced fear (and probably more likely to be liberal). Do Republicans Live In A Nightmarish Landscape? 1. “Reliving the event, which disturbs day-to-day activity,” which including repeated nightmares of the event and strong, uncomfortable reactions to situations that remind you of the event. Some of these sound remarkably similar to the perspective Holland is claiming conservatives live in with their increased gray matter volume in the amygdala. In other words, those with PTSD have reduced gray matter volume in the amygdala and can literally be experiencing a “nightmarish landscape,” while conservatives with their enlarged gray matter in the amygdala are, as Holland believes, are experiencing the same thing. 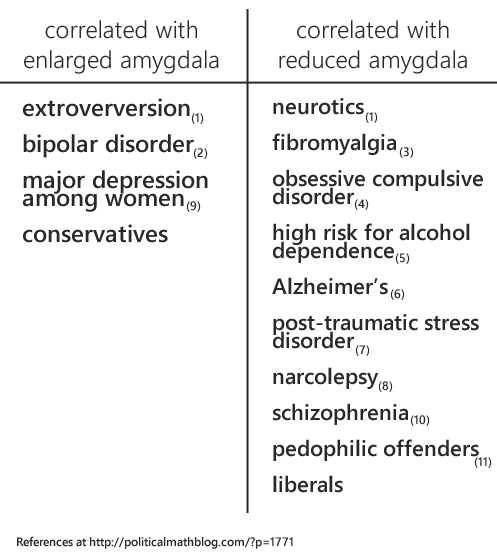 Those with PTSD can be crippled by fear, so maybe an enlarged amygdala makes conservatives far superior to liberals in dealing with the fear they face… Or maybe the amygdala is just not that simple. If gray matter volume were a direct correlation to function and behavior, how much easier a neuroscientists job would be! Actually, it probably wouldn’t be that simple because everything would be figured out by now and they would be out of a job. I looked only at the amygdala here because I’m lazy (and because the blog owner didn’t want me to attack the Holland’s other issue with the of the anterior cingulate cortex in a single blog post). The point (and truth) is that we’ve got a lot of good ideas about some areas of the brain. It is absolutely true that the amygdala is activated in fear and anxiety responses. However, to say that this is *the* function of the amygdala or that increases in the size of the amygdala indicate a worldview that is warped by fear is journalistic extrapolation based on a pre-determined bias, nothing more. I am confident that conservatives may react to fear differently than liberals. As indicated in the second study, conservatives look toward fear while liberals look away (14). This may be somewhat related to the higher ratio of conservatives to liberals among our armed servicemen and women—those whose job it is to run toward dangerous, fear-inducing conflict rather than away. Is this tendency to focus on sources of fear a weakness? As an aside, I find it unprofessional that Holland is citing a Huffington Post article about this study (written and interpreted by our journalist friend, Mooney) without any link/citation to the study itself. The eagerness to use the results of these studies to justify his position would be laughable if the general population didn’t find neuroscience to be beyond their grasp. As it is, it can barely be said that a basic understanding of neuroscience is within the grasp of even today’s renowned neuroscientists—and they’ll tell you that themselves. The point is that interpreting science is difficult, answers are not easy to come by, and almost nothing is as simple as online political editorials would have you believe. 1. Omura, Kazufumi; Todd Constable, R.; Canli, Turhan. Amygdala gray matter concentration is associated with extraversion and neuroticism. Neuroreport. 16(17):1905-1908, November 28, 2005. 2. Altshuler LL, Bartzokis G, Grieder T, Curran J, Mintz J. Amygdala enlargement in bipolar disorder and hippocampal reduction in schizophrenia: an mri study demonstrating neuroanatomic specificity. Arch Gen Psychiatry. 1998;55(7):663-664. 3. Burgmer, Markus, Markus Gaubitz, Carsten Konrad, Marco Wrenger, Sebastian Hilgart, Gereon Heuft, and Bettina Pfleiderer. “Decreased Gray Matter Volumes in the Cingulo-Frontal Cortex and the Amygdala in Patients With Fibromyalgia.” Psychosomatic Medicine 71 (2009): 566-573. 4. Szeszko PR, Robinson D, Alvir JJ, et al. Orbital frontal and amygdala volume reductions in obsessive-compulsive disorder. Arch Gen Psychiatry. 1999;56(10):913-919. 8. Kaufmann, Christian MSc; Schuld, Andreas MD; Pollmacher, Thomas MD; Auer, Dorothee P. MD. Reduced cortical gray matter in narcolepsy: Preliminary findings with voxel-based morphometry. Neurology. 58(12):1852-1855, June 25, 2002.